Hypersonic flight requires aerospace vehicles to withstand extremely high temperatures as well as to be ultra-lightweight. To develop the capabilities to design and manufacture these aerospace vehicles, our Department mission seeks to enable students to master the comprehensive, trailblazing nature of aerospace engineering unseen in other engineering fields. 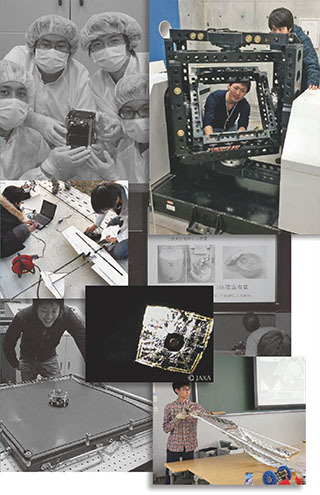 The present program began as a special Aeronautics course within the department of Mechanical Engineering in 1954 by Professor Hidemasa Kimura, leading researcher in Japan’s aeronautic field. In 1978, Aerospace Engineering was established as a separate department, with the graduate program in Aerospace Engineering following in 1979. The faculty for the Graduate program consists of professors concurrently attached to the Department of Aerospace Engineering. Current research activities in the course include systems analysis, and research and development of the optimal design methods of aircraft, rockets and satellites. Students in the course are strongly encouraged to present their research findings in national and international conferences.